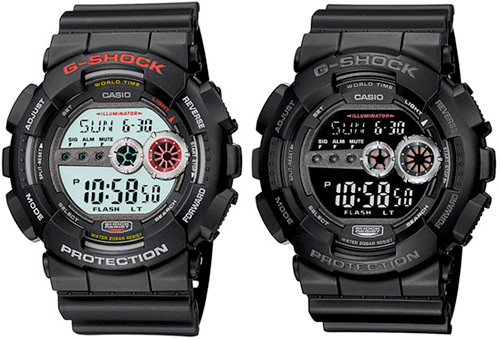 Casio G-Shock GD-100 Is Easily The Brightest Kid In Its Class | OhGizmo! By Andrew Liszewski on 08/24/10 • Leave a comment! Waaaay back in 1992 Timex introduced their first Ironman watch with electroluminescent Indiglo backlighting and the world of watch face illumination has never looked back. But even though it provides ample illumination for an LCD display (and perfectly stealthy illumination for use in a dark theater) I guess Casio figures there’s finally room for improvement. So their new G-Shock GD-100 models, which will be available at the end of September, feature a new LED backlighting system that’s 6 times brighter than your standard LED. Now I’m not sure who needs a watch that bright since the iPhone 4 has already taken over flashlight duties for a lot of us, but since the G-Shock line seems designed to handle any situation, I guess it’s nice to know it’s there.